Pawel left the lab in September 2017. Click his LinkedIn tag. Invention and science of mechanics have provoked my interest in engineering since early years, thus I chose to study Mechanical Engineering as my first university education. After completing my basic engineering training at the Technical University of Lodz, I specialized in computational solid and fluid mechanics at the Royal Institute of Technology in Stockholm, Sweden. My graduation project on numerical simulations of electrophoretic phenomena in e-paper displays with Philips Research in Eindhoven triggered my interest for applied research. Ph.D. project at University Medical Center Groningen/University of Groningen introduced me to fascinating field of implant biomechanics. 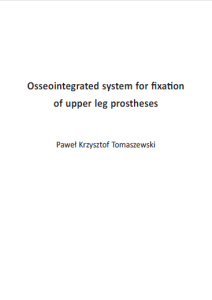 To overcome biomechanical problems of current implants for direct osseointegrated attachment of an artificial limb to the skeletal system, we developed a new concept of implant for amputated patients. The aim was to restore the natural load transfer in the femur and allow implantations in short bone remnants. We hypothesized that an implant composed of a metallic core sliding in an elastic sleeve will reduce peri-prosthetic failure risk and bone loss. Finite element analysis and experimental techniques were used to verify that the novel concept produced a more physiological stress and strain distribution in the bone, reduced failure risk and minimized long-term bone loss. Tribological experiments indicated optimal material combination for the new implant, namely diamond-like carbon coated PEEK polymer and titanium alloy. Insights into manufacturing feasibility and surgical procedure were gained in in-vivo trials. Currently I continue with new concept development, numerical and experimental biomechanical analysis and pre-clinical testing of orthopeadic implants. Experimental assessment of a new direct fixation implant for artificial limbs. J Mech Behav Biomed Mater. May;21:77-85, 2013. Tomaszewski PK, Verdonschot N, Bulstra SK, Rietman JS, Verkerke GJ. J Mech Behav Biomed Mater.15:167-75, 2012. Numerical analysis of an osseointegrated prosthesis fixation with reduced bone failure risk and periprosthetic bone loss. Tomaszewski PK, van Diest M, Bulstra SK, Verdonschot N, Verkerke GJ. A comparative finite-element analysis of bone failure and load transfer of osseointegrated prostheses fixations. Tomaszewski PK, Verdonschot N, Bulstra SK, Verkerke GJ. Ann Biomed Eng. 38(7):2418-27, 2010.